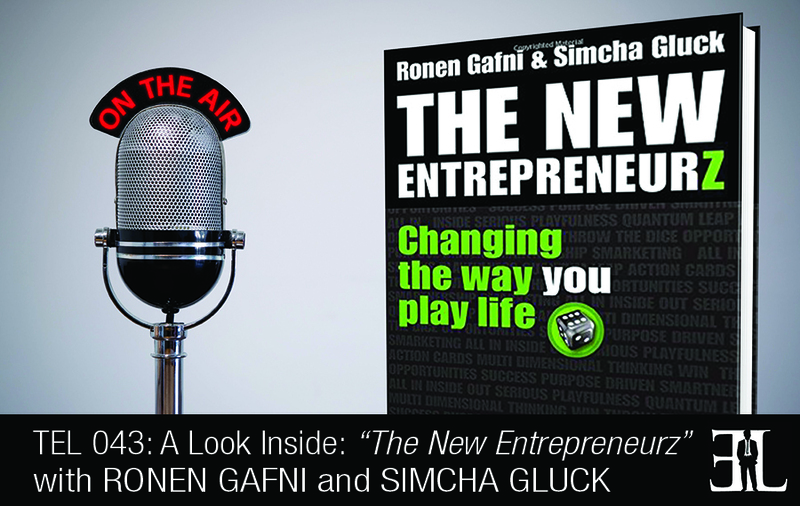 In this episode Ronen Gafni and Simcha Gluck take a deep dive into their book, The New Entrepreneurz. In their book, Gafni and Gluck talk about entrepreneurship as a mindset and you can have a mindset of an entrepreneur even if you won’t have a business. A lot of books on entrepreneurship are from authors who are at the end of their journey and this book starts in the middle. As you read each chapter you will find yourself participating in a fun, bite-size lesson you can apply to your life or business. This book is perfect for the wantrepreneur or first-time entrepreneur who has yet to fully grasp the concept and evolution of entrepreneurship today. In today’s world entrepreneurship is all about the process and being driven. A lot of books on this topic are from authors who are at the end of their journey. In this book we are just in the middle of our journey and explain to you what leads people to live a purpose driven life. In the book we talk about entrepreneurship as a mindset and you can have a mindset of an entrepreneur even if you won’t have a business. We invite you to not only read the book but also play the game as you read it. This is a book that is written with fun in mind so each chapter is its own bite size playable lesson. You can read a chapter here or there to get different takeaways to apply to your life or you can read the entire book. Simcha – Life is right now. You have everything you possibly need at your fingertips as long as you have the right mindset of how you see things. Ronen – I advise people to take the win to win concept. Understand that everyone can win, because everyone is playing their own game and it’s not a competition. This is your life and you’re on this planet because you have a very specific purpose and no one else can do it for you. We open up with the analogy that we have been living in a great world up until now. All of the sudden you take a moment of thoughtfulness and mindfulness to climb the tallest mountain and when you do, you look out and see that there is another mountain. Another island a little further away that has very similar technology but you’re able to get better results, you go further, smarter, faster and better. The only reason you go further, smarter, faster and get better is because you think differently about it. Our goal in the book is to build the bridge that takes people from the old island to the new island, the smarter island of the new entrepreneurs. Ronen opens up where he shares his personal journey of coming up with this idea of creating a FreshBiz game, a game that trains people on multidimensional winning. Winning through collaboration as opposed to all the old school games that all of us have been brought up playing that were based on competition. We think that you have to kill or be killing and so often we bring that mindset to school, business and relationships and all of the sudden we end up damaging people because we think that life is one massive competition. We need to realize that the world has changed completely and in the new shared economy every one of us can all win our own game, we all have unlimited resources at our fingertips. Ronen shares his personal story which involves him actually having to sell his house to print and produce the first thousand games. And even though it was challenging, he explains why it wasn’t a very scary risk for him. We talk about the life hackers and the games. When we talk about hackers we don’t mean people who are illegally breaking into programs, we mean people who are literally hacking life, business or marketing and are able to get better results while accomplishing things that most people ordinarily couldn’t accomplish. We also talk about the evolution of entrepreneurship, why it’s changing and how it’s possible. We take the readers through our FreshBiz language. We talk about the win to win power which just means a higher winning for everyone, winning in many dimensions and not just the dimension of money. In today’s world we don’t want to just win the money game, we also want to win the relationship and business game. After that we talk about what we call action card. Action cards in the game of FreshBiz are unique abilities and talents. It’s important to know how to identify each action card in life and how to use them. Action cards are a way of opening up the distinction that we have tremendous amount of things at our fingertips and we need to get really good at assessing what they are. One of the chapters in the book is called Red and Green titles. Red titles are mandatory, they are actions that you must take and green titles are optional, things that you can do. An example of a red title in life is you must pay taxes. An example for a green title in life is going to college. We take people through the process of starting to distinguish for themselves what really is optional and what is mandatory. Smart Business is another chapter in the book and is one of the more powerful chapters. We talk about how it takes three things to be considered a smart business. The first thing is it has to meet your lifestyle. It is really important that you create something that is sustainable and really allows you to flourish. The second thing is it has to be win to the win power, it’s got to have multidimensional winning. If your clients are winning but you are losing, that doesn’t work. The third thing that you have to have to be considered a smart business is it has to be purpose driven. Do something not just because it makes money but because it is an extension of who you’re meant to be in the world. The All-In chapter is about becoming someone who you are willing to go All-In for. Another chapter is called You Already Won the Game. It is important that people have a context for when they do things in their life, to do it from a place of confidence. When someone has already played the game a few times and sits down the play it again, they already know that they are capable of winning. Knowing that you can already win a game that you are about to play brings confidence and fluidity. This allows you to have fun, be creative and invite others to play it. We have so many resources and so many free sources that we need to start using. The last chapter of the book talks about solving the world’s greatest problems. This chapter is basically about how the new entrepreneurs can be a major step forward in solving these problems. When I talk about entrepreneurs I am not saying that in order to be one you must have started or be starting a business. Entrepreneurship is for people who want to play life in a different way. My name is Ronen Gafni, I am 42 years old, have two kids and live in Israel. I developed a game called FreshBiz, it’s the game for development of independent real thinking. It’s been a journey for the past 10 years. Simcha and I have been touring the globe playing the game with over 20 thousand people from 20 different countries bringing the message of a new mindset towards business and entrepreneurship. My name is Simcha Gluck. I’m the Chief Fun Officer of Fresh Biz, I co-author the book with Ronen and I’ve been a serial entrepreneur since I was 20 years old and am currently 35. I am originally from New York but now live in Israel with my wife. While traveling and training entrepreneurs all over the world in different communities we started to see that entire face of what entrepreneurship has typically been over the past 10, 50 or 100 years has completely changed. It was important to us to write a book that features a new way of looking at things and living in the new shared economy that we are in. That is the inspiration for The New Entrepreneurz, the new people who literally are changing the way they play life one game at a time.